Yoga offers so many incredible benefits. From stress reduction to a deeper connection with your spiritual side, everyone could use a little yoga—but no one needs it more than the residents of Hawkins, Indiana in 1983. Our favorite Hawkins town folk were under some serious stress in Season One of Stranger Things, and after watching the teaser trailer for Season Two, we can be sure that things won’t calm down any time soon. Yoga might not be able to solve the mysteries of the Upside Down, but it can at least help Eleven and the gang cope with whatever bizarre twists and turns come their way. But be careful! This post is full of spoilers, so if you haven’t watched Season One, take Dustin’s advice and turn back now! 1. Because yoga can keep you sane, even when it looks like you’re going crazy. Yoga can’t make people believe your son was abducted by an evil monster and taken to an alternate universe, but it can make it a little easier when someone gives you the side-eye. 2. Because Eleven needs to go to a happier place when she meditates. For most of us, meditation is a way to clear our minds and find some inner peace. For Eleven, it’s a way to get travel to the Upside Down. Guided visualization could help her to re-purpose those meditation skills to bring her somewhere positive—like a room full of Eggos, for example. 3. Because the boys need to stretch during those marathon D&D sessions. Sure, they might not worry about back pain now, but if they want to avoid chronic pain when they’re older, they’d better do a few forward folds in between battles with the Thessalhydra. 4. 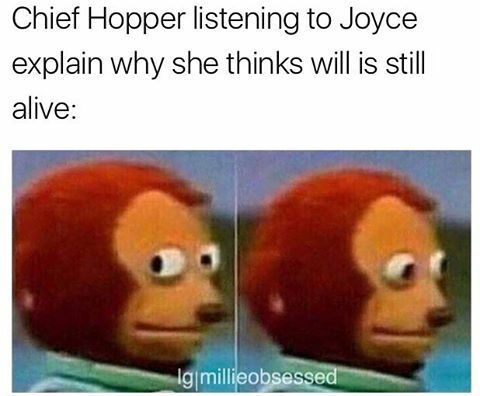 Because Hopper really needs a better coping mechanism. Poor guy. Between the death of his daughter, his divorce, and now the bizarre missing persons cases he’s supposed to solve, it’s no wonder he’s turned to substances to ease the pain. Yoga can be a powerful tool to help overcome addiction. Let’s hope Hopper starts hitting the mat instead of the bottle. 5. Because Lucas already owns a cool bandanna—so why not try hot yoga? We’re not saying yoga is all about the clothes. But if you’ve already got the perfect outfit that will also keep sweat out of your eyes, you might as well show it off in class. 6. Because Dr. Martin Brenner is majorly violating the first limb of yoga and it’s NOT OKAY. The first and most important of the Yamas—the first limb of yoga that lays out yoga's moral and ethical guidelines—is non-violence. And yes, Dr. Brenner, that includes subjecting little girls to torture. 7. Because meditation might have brought Steve to this realization sooner. It’s great that Steve eventually teamed up with Jonathan to fight the Demogorgon, but it would have been even better if he’d spared him all that pain to begin with. You should have meditated on your friendship goals, Steve. 8. Because El REALLY needs to practice self-love. How heartbreaking was this moment? We all love Mike for reassuring Eleven that she’s not a monster, but true self-acceptance has to come from within. Repeat after me, El: I am worthy of love. 9. 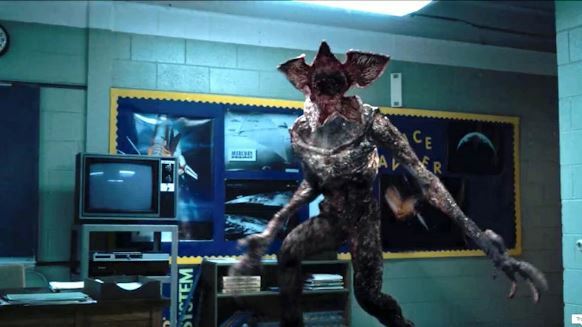 Because yoga would have been a better hobby for the Demogorgon. Kidnapping children and dragging them to the Upside Down is not cool, man. Go to a yoga class or something. 10. Because El’s temper can get a teeny bit out of control. Okay, so this kid totally deserved it. But with crazy telekinetic powers comes a lot of responsibility. Yoga can help El make sure her temper never gets the better of her, so she doesn’t end up doing something she regrets. 11. Because pedaling away from evil takes a LOT of leg strength. There are tons of poses that can build leg strength, which the boys will need if they’re going to escape evil scientists by bike. Pedal faster, guys! 12. Because pausing for self-reflection can lead to better teenage choices.
. . . you know, the kind of choices that won’t get your best friend killed. RIP, Barb, we miss you! 13. Because an open Third Eye Chakra would have helped Hopper see the truth sooner. At least he got there eventually. 14. And finally, because everyone needs a little help dealing with the mouth breathers. People are frustrating, whether they’re fictional or not. Yoga can teach all of us to have a little patience with the people who annoy us most. Are you excited for Season Two of Stranger Things? Tell us your predictions—and who else in Hawkins could use yoga—in the comments!